Web site owners and bloggers know the importance of monitoring the traffic for their site. In fact, many webmasters constantly pore over their sites analytics data to find ways to increase traffic and improve overall success. Much of the time, that data comes from Google Analytics, the software giant’s Web metrics service. Analytics App from AnalyticsApp.com puts Google Analytics in the palm of your hand, giving you instant access to all your Web sites and the data reports you crave. Data at Your Fingertips: Analytics App has 29 reports available, but they're all easy to access, thanks to a well-organized and navigable app. Analytics App features a long list of 29 available reports, leaving nothing to be desired. Using Analytics App for the first time left me truly impressed with the way all the reports are organized and how easy it was to navigate this large amount of data. The slick interface makes using this app a breeze—so much so in fact, that I actually prefer viewing my site’s reports with the Analytics App rather than on the desktop. Setting up Analytics App couldn’t be easier. Just enter your Analytics login info and you’ll see a complete list of all the Web sites you track with Google Analytics. You can also check different Google Analytics accounts by tapping the Settings button and changing the login info at any time. Your login information is stored only on your iPhone or iPod touch; any communication is strictly between the device and Google’s servers, keeping your private information secure. Once you’ve selected one of your Web sites from the list, you to to the main menu. Several groups of reports are available there—Overview, Visitor, Traffic, Content and Event Tracking. Within each of these groups, you’ll find additional reports, covering different areas-traffic sources, keywords, adwords campaigns, event tracking, custom reports, and much more. My favorite report is Today; it provides an overview report on your site for that day, which makes it easy to stay up-to-date on your site’s traffic patterns. The Dashboard brings up the same report over the last 30 days, and if you would like to view the Dashboard’s or any other report’s data over a different date range, simply tap the Date button at the top left of the screen and enter the desired date range. Indeed, for many of us, checking our analytics data has nearly become an obsession. Analytics App is bound to take that obsession to the next level. Being able to find out what keywords, search engines and Web sites are sending you traffic on the fly and with such ease makes this app one of the best around. 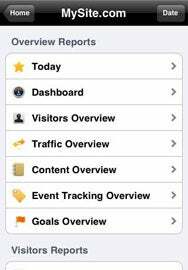 Analytics App is a must-have for any Google Analytics user with an iPhone or iPod touch. Analytics App is compatible with any iPhone or iPod touch running the iPhone 2.2 software update.